Typ disku:SSD; Formát:2.5"; Kapacita pevného disku (v GB):128; Rozhraní:interní Serial ATA III; Rychlost otáček (v RPM):SSD; Velikost bufferu (v MB):Nespecifikováno. 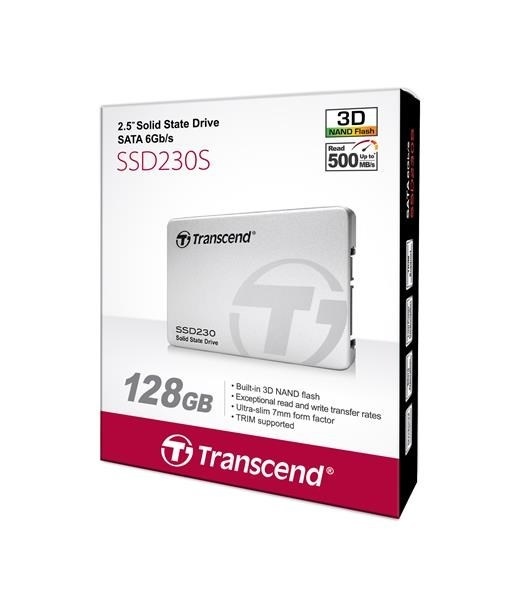 Transcend's SSD230 is equipped with a DDR3 DRAM cache that provides an incredible 4K random read and write performance of up to 300MB/s, making it the perfect choice as a boot disk for everyday computing tasks and programs. 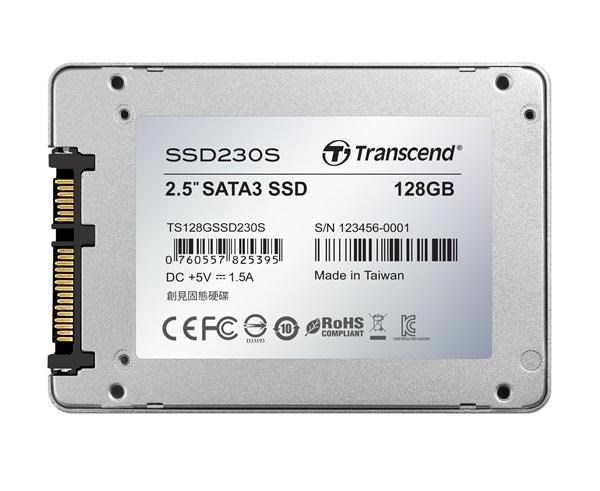 Taking full advantage of the SATA III 6Gb/s interface and built in with SLC caching technology, the SSD230 achieves exceptional transfer speeds of up to 560MB/s read and 300MB/s write. In addition to blazing-fast transfer speeds, the SSD230 is engineered with a RAID engine and LDPC (Low-Density Parity Check) coding, a powerful ECC algorithm, in order to keep your data secure. Built-in wear-leveling technology ensures data integrity during transmission, prolonging the lifespan of the drive. 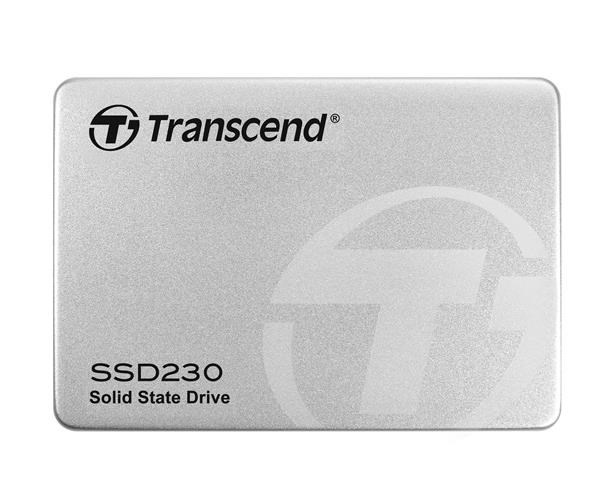 To keep your Transcend SSD running fast and error-free, Transcend's advanced SSD Scope software application is available for download for use with the SSD230. Monitor your SSD's health status with S.M.A.R.T. technology, enable the TRIM command for optimum write speeds, keep your SSD's firmware up-to-date, and migrate data from your original drive to a new SSD with just a few clicks. 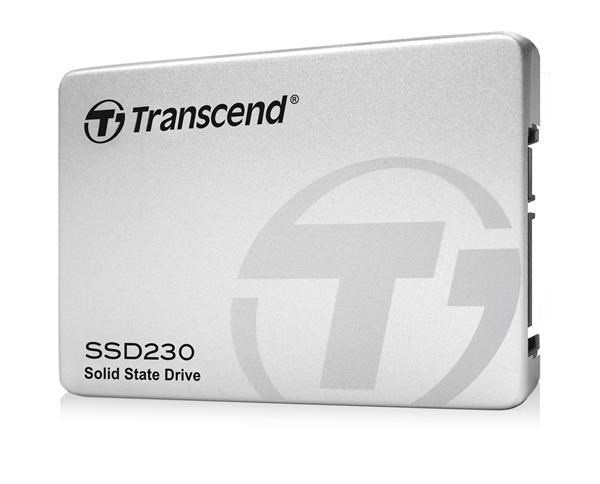 The SSD230 features an industry-standard 2.5" form factor. Yet, it measures just 6.8mm in height and weighs in at a mere 63g, making it supremely well-suited for ultra-thin computing devices such as Ultrabooks as well as mainstream PCs.